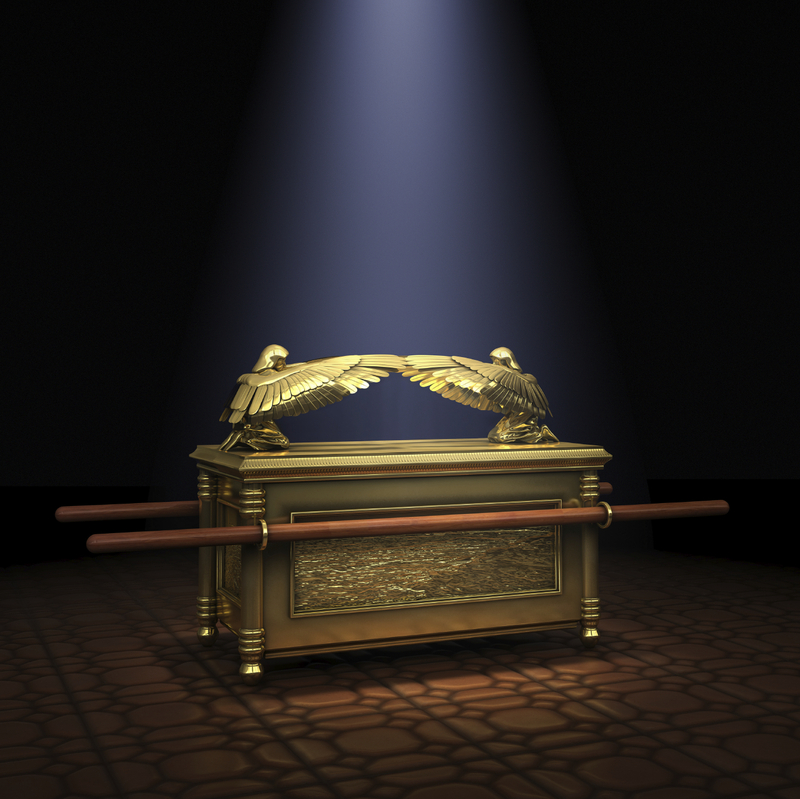 One of the main goals of The Mitzvah Project is to find the Ark of the Covenant that existed in the days of Moses, Joshua, King David and many of the other kings and prophets. The Ark was made of wood covered with gold, and had two golden cherubim (angels) on top facing each other. It contained the second tablets that Moses brought down from Mount Sinai. The tablets were made of sapphire, and were inscribed with the Ten Commandments, “by the finger of God”. Of course there are many different opinions as to what happened to the Ark. Most everyone agrees that it has not been found as of today. Please keep in mind that the picture shown above is just a computer generated idea of what the actual Ark looked like. The actual Ark used wooden staves that were covered with gold, and they pointed in the opposite direction. The tips of the staves pressed against the “Parochet” or curtain that was in front of the Holy of Holies. There are three main theories as to what happened to the Ark. The first explanation is that the Ark was hidden in a maze of tunnels under Mount Moriah, also known as the Temple Mount. When King Solomon built the First Temple on Mount Moriah, he was told by his father King David that it would be destroyed. King David instructed Solomon how to build a chamber under the Temple, so that the Ark could be safely stored in a vault there. The first opinion is that this vault was built underneath the location of the Holy of Holies in the Temple Sanctuary. The second opinion is that the vault was located under the Chamber of Wood in the Women’s Courtyard of the Temple. The third opinion is that the Ark was taken away with some of the other sacred articles by the Babylonian conquerors. We follow the opinion of Rambam according to the Mishnah Torah (Explanation of the Teachings). Rambam writes that King Josiah commanded that the Ark be hidden away according to II Chronicles 35:3, “And he said to the Levites who were enlightened above all of Israel: ‘Place the Holy Ark in the chamber built by Solomon, the son of David, King of Israel. You will no longer carry it on your shoulders. Now, serve the Lord, your God. '” When the Ark was hidden away, the wooden staff of Aaron and Moses, a vial of heavenly manna, the special anointing oil, and other items were placed with it. These sacred articles did not return in the Second Temple Era. It is the opinion of The Mitzvah Project that the Ark of the Covenant is still buried underneath where the First Temple stood on Mount Moriah. We feel the First Temple was located in the northern section of Mount Moriah, away from where the Dome of the Rock is now located. The Second Temple was built where the Dome of the Rock is today, we know this. However there has always been some controversy as to where the First Temple was located. We feel that if the Ark is found in the northern section of the Temple Mount we will know that the First Temple was built there. Besides the fact that this section of the Temple Mount is currently vacant, it will allow the Third Temple to be built without harming the other structures there now. This will relieve a tremendous amount of pressure that has built up in the Middle East. The Moslems know that a Temple will be built on Mount Moriah, they just don’t want either of the two mosques to be damaged. The Jewish People have been without a Temple for almost 2000 years now. God’s Presence in the Temple is meant to be the central focus in Jewish life. There has been pressure building up for a long time because of our inability to actually fulfill the mitzvahs we are supposed to do. It seems obvious that without the Golden Ark we cannot really pinpoint the location of the First Temple on Mount Moriah. The Ark is a vital part of the Third Temple. We ask everyone to do what they can to learn about the Ark, and discuss it with your friends and family. This topic is covered in greater detail in the section about building the Third Temple in Jerusalem on Mount Moriah. There is one significant event that happened a few years ago in Israel. There is a long tunnel that runs along the outside of the Western Wall (Kotel) of the Temple Mount. It is commonly known as the Kotel Tunnel. The tunnel begins near the Western Wall, then turns and slowly drops about 30 feet below the present level of the Old City. At the end of the tunnel there are stairs leading back up to the present level of the street. Some years ago, in the northern section of the tunnel some people began excavating through the wall into the Temple Mount. The reports were that after they had been digging a while, they came upon what looked like a large quantity of golden objects. Unfortunately word of this got out too quickly, and the wall was sealed up with six feet of cement in order not to cause a problem with the Moslems. The section that was filled in is easy to see inside the northern part of the tunnel. Perhaps recovering the Ark is easier than we think. With God’s help we can have World Peace now and forever. It is time for peace to be a reality instead of a dream. May God bless you and your family always, and Baruch HaShem!